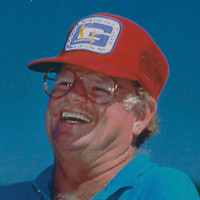 Captain Bob Montgomery was a Florida native and second generation guide, following in the footsteps of both his father and uncle. He passed his love of fishing along to his daughter, Michelle. After his discharge from the Navy, Montgomery started light tackle fishing in Key West in January of 1969. At the time, there were only two other light tackle guides in the area, one being his brother, Capt. Gene Montgomery. Before there was GPS, Montgomery’s engineering expertise served him well on the water in locating and then relocating prime fishing areas throughout hundreds of square miles off Key West. Using variable factors of tides, wind, the boat’s speed and more, he could calculate and pilot his boat, the Blue Runner, by dead reckoning to the channels, reefs, holes and wrecks for any number of favored species of fish. This skill gave him a big advantage in putting clients on fish. In 1971, he guided Jim Lopez to win the coveted MET tournament Master Angler award. For many years he enjoyed spending the month of May fishing for the big silver kings in Homosassa. Montgomery appeared in two episodes of ABC’s American Sportsman with Curt Gowdy. One segment featured Terry Bradshaw (1971) and another included both Jonathan Winters and Ernest Borgnine (1974). He was an active member of the Florida Keys Fishing Guides Association and served on its Board of Directors for many years. Montgomery also served on the Board of Directors for Redbone, Inc., a non-profit to raise funds for Cystic Fibrosis Research.